Read the article in Deutsche Welle. 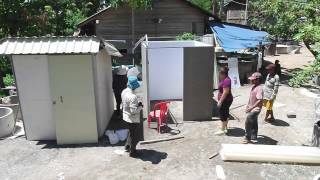 Local innovations have catapulted Cambodia, which has long had dire toilet use numbers, to be a leader in sanitation. On World Toilet Day, the country gears up to attain ambitious new targets, Joanna Mayhew reports. 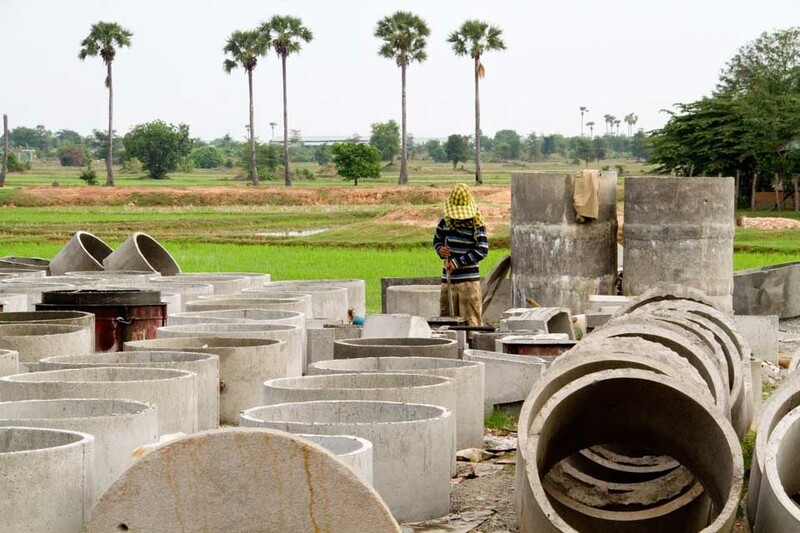 Along a nondescript dirt road in Cambodia’s Kampong Speu Province – located west of the capital Phnom Penh – Chhum Nimol’s front lawn is a hub of industry, littered with piles of sand and rocks, molds, large concrete rings and ceramic platforms. The scattered pieces represent the components of a simple product making a significant impact: a toilet. The home-based factory, which sells 10-20 toilets per month, is a minor part of a major movement to improve the country’s latrine access. Cambodia is notorious for its poor sanitation indicators – ranking one of the worst in Southeast Asia. A large portion of the population lacks access to toilets and, as of 2011, 69 percent of rural residents were still practicing open defecation, according to the World Health Organization (WHO) and UNICEF. The consequences are dire, with widespread respiratory illnesses and diarrhea – which causes 10,000 deaths annually, including one-fifth of the deaths of children aged five and younger, says UNICEF. San Ny recalls significant sickness in her family, particularly her grandchildren, before purchasing a toilet last year. But the 54-year-old has seen that change after using the basic tin-roofed facility, near her stilted wooden home. “It’s easier if I don’t need to go far,” she says, adding that defecating outside has become more complicated in recent years as forests have been reduced and the area has grown congested. Similar to others, Ny feared having to leave the house at night, especially as she ages. Rural residents also worry about being attacked by snakes or insects, and women can be vulnerable to violence in isolated areas. Social costs also exist, such as the shame associated with being seen or being unable to offer guests a bathroom. Yet after years of stagnant statistics, Cambodia is becoming known for its achievements. Toilet coverage in rural areas has doubled in the last five years, from 23 to 46 percent, according to the Ministry of Rural Development. In 1998, rural coverage was less than 10 percent. “We still lag behind. But…we [have made] a big achievement because we started with nothing,” says Chreay Pom, director of the ministry’s Department of Rural Health Care. “The pace of change is phenomenal,” adds Michel Dauguet, WASH program director at non-profit iDE Cambodia. Production costs have also plunged, making toilets, which now cost as little as $55, accessible for an increasing proportion of the population. Pom estimates 80 percent of Cambodians can now afford latrines, either paying cash or through loans. Nimol’s neighbor and customer, Sok Kun, did not own a toilet until age 54, three years ago. She laughs recalling the first time she used one, saying she initially did not know how, and was relieved at how easy it was compared to outdoors. This success is partly due to locally pioneered approaches such as sanitation marketing, which focuses on the perks of toilet ownership. “Cambodia has been a significant leader. It’s been a place where new things are being tried,” says Geoff Revell, regional program manager at non-profit WaterSHED. Starting in the early 2000s, traditional programs focused on education or fear of germs and disease and were successful in raising awareness, as a majority of Cambodians now understand the benefits of toilets. But this has not always resulted in toilet purchases. Therefore new approaches, used by both iDE and WaterSHED, appeal instead to motivators such as pride and the desire of families to have a bathroom to preen themselves. The government says its long-term efforts in raising awareness and creating demand led to the success of sanitation marketing. “When demand is created, there’s a potential for the supply side to play its part,” says Pom. The combination is paying off. In recent years, iDE and WaterSHED have enabled the sale of more than 260,000 toilets, by working with suppliers such as Nimol. Prior to starting their business six years ago, Nimol and her husband, Seab, produced well rings. Since switching, they have more than doubled their monthly profit, to $100. Nimol says she has seen demand increase significantly. Only 10 out of 200 families in their village remain without toilets, though in surrounding communes, about 50 percent of households still lack latrines. The government is aiming for universal access by 2025, with a mid-term goal of reaching 60 percent by 2018. Last year, the government released a national strategic sanitation plan, and is set to release a national action plan in December. “It’s an ambitious plan, but we need such high goals to work hard together,” says Pom, adding the government was pleasantly surprised to surpass its 2015 target. But numerous challenges remain. While toilet ownership elsewhere is normally divided along economic lines, in Cambodia even the well-off might forgo toilets due to long-held habits, says Revell. Progress has also been impeded by contradictory approaches, as some organizations provide free toilets, distorting the market. Free toilets have also raised expectations for latrines, and families will delay purchasing toilets until they can afford luxury ones, says Pom. Sanitation players also need to improve supply chains, develop low-cost shelters and toilets for flood-prone areas, and improve sanitation for young children, who are most at-risk of disease, yet who often do not have toilets that cater to them.